The second day of King Harald V and Queen Sonja of Norway's joint birthday celebrations included a black-tie gala at the Opera House in Oslo. Even without tiaras, we saw some major jewels on display. Here's a look at what the Scandinavian royals wore; we'll recap the rest of the royal jewels in our next post! After last night's emerald spectacular, Queen Sonja chose quieter pearls for the gala: earrings, necklace, and bracelet. 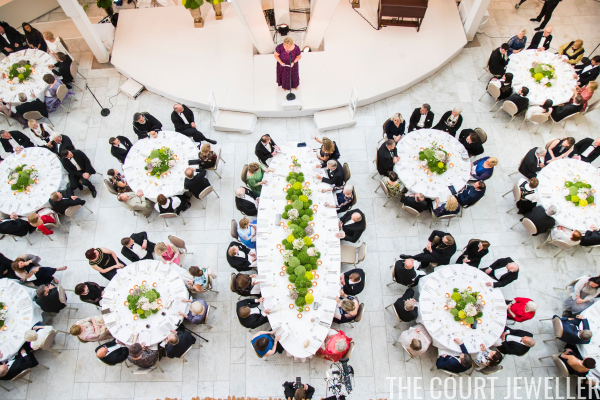 Her white cape-coat covered a vibrant blue gown. Crown Princess Mette-Marit of Norway wore the same diamond pendant earrings she wore last night, but this time she added her faceted red gemstone (ruby?) drops instead of pearls. Princess Martha Louise of Norway was radiant in a fun pair of multi-gem pendant earrings. The earrings picked up on the various colors in her bright pastel gown. 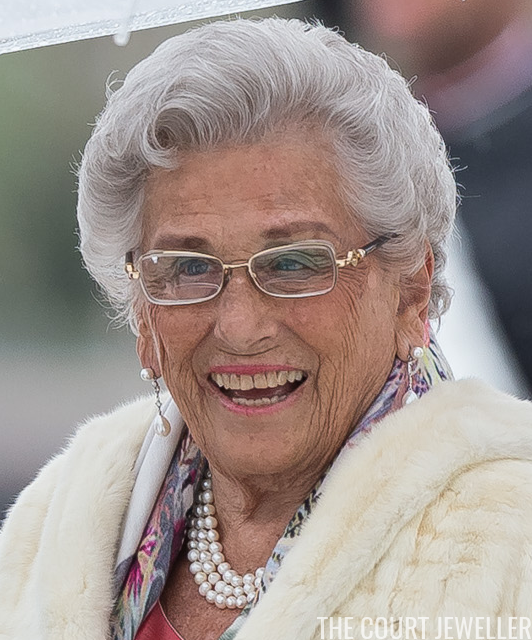 Like her sister-in-law, Princess Astrid chose pearls for the opera house gala. I'm pretty intrigued by that gem-set golden bangle on Astrid's right wrist. 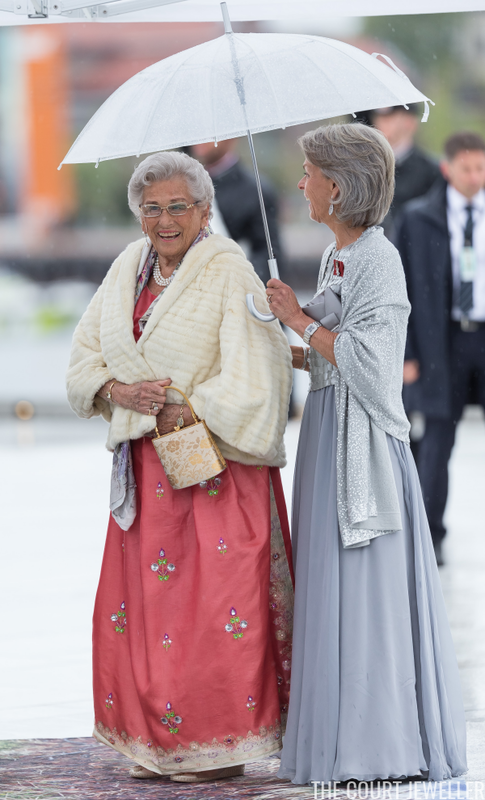 Queen Silvia bundled up against the persistent rain, but we got a glimpse of the family's diamond floral earrings and a diamond riviere. Her dark patterned dress peeked out as she and King Carl XVI Gustaf arrived at the Opera House. 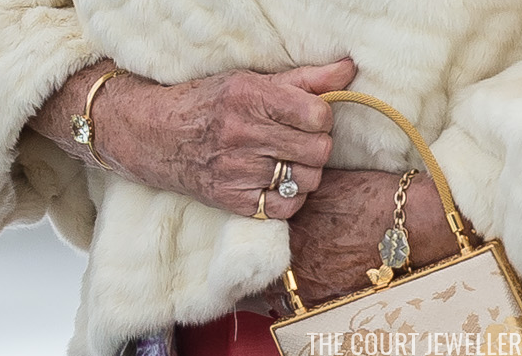 Victoria also wore a few bracelets, including a large silver cuff. Here's a better look at Victoria's entire ensemble. Princess Sofia of Sweden chose delicate gold pendant earrings, sweeping her hair aside to offer us a clearer view of the jewels. She matched her gold earrings to a golden clutch bag. Queen Margrethe II of Denmark was also wrapped up in a cloak, but we can see Queen Alexandra's sapphire demi-parure peeking through here. Here we get a view of the necklace, too. I think she's wearing the same gown and jewels that she chose for another recent gala in Norway. Crown Princess Mary brought along some glitter from Denmark, wearing diamond fringe earrings with a floral motif. She also wore a stunner of a sapphire and diamond ring on her right hand. The bright blue gemstone in the ring picked up the blue hues in her floral gown. Prince Joachim and Princess Marie joined the royal pack for tonight's gala. She kept her jewelry fairly simple, wearing a pendant necklace with a blue (sapphire?) stone and glittering earrings. Her gown, also on the simple side, looked like one of the most comfortable of the night. Stay tuned shortly for more jewels from tonight's gala!